The Etobicoke Community Concert Band (ECCB) was established, twenty two years ago, in January 1995 with the goal of providing a fun and challenging environment where local amateur musicians could share their passion for music and perform regularly in their community. From its first rehearsal attended by twenty musicians, to its present roster of fifty one dedicated members, the ECCB has successfully pursued a vision of presenting a diverse and entertaining repertoire at a wide variety of venues throughout the city. Under the dynamic leadership of John Edward Liddle, the band and its various ensembles have made a significant impact on the community of Etobicoke – several thousand people hear the band each year in our many public performances – and on the community of adult and student wind musicians in Etobicoke. Over the years, we have continued to add new and innovative programming and formed many financial and musical partnerships in the community. 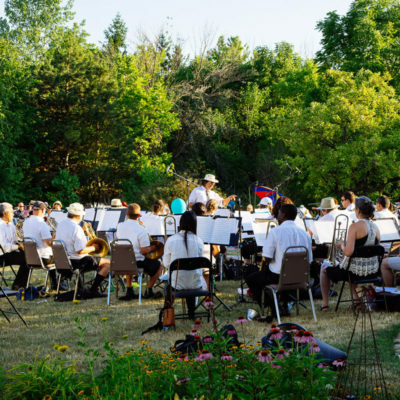 The Etobicoke Community Concert band is a truly unique organization and a true success story – from the passionate inspirations of our artistic director to the incredible dedication and enthusiasm of each and every member.